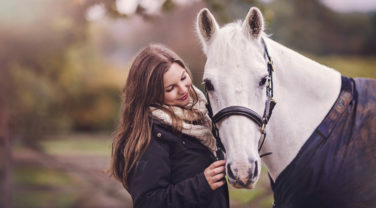 Horses are living longer but are often healthier for longer too and so just because a horse or pony is in their twenties or even their thirties, it doesn’t mean their nutritional requirements have changed. If they are still holding their weight well and can eat without any problem – as many native ponies in their thirties can, there is no need to make any changes. However, for those that are starting to show signs of old age, a few key adjustments can help them continue in good condition for many years to come. Loose, worn and missing teeth are a common problem for veterans and as forage should make up at least half of every horse’s diet, it is no surprise that when they simply can’t eat it as easily any more, weight loss and colic can occur. PPID is another issue that is associated with age. Previously known as Cushings Syndrome, PPID or Pituitary Pars Intermedia Dysfunction, is a degenerative endocrine disorder that disrupts the control of hormones produced in the pituitary gland. Horses and ponies with PPID are predisposed to laminitis and so their diet and management should reflect this. Weight loss, choke and colic can also be related to poor dentition. My horse is older. Do I need to feed a senior specific feed? 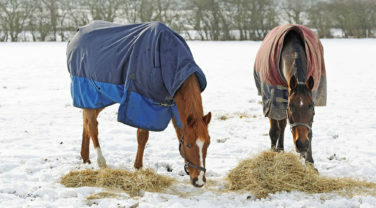 If your horse is just old in years but not in condition and has no specific health issues then you can continue to feed them as you would any other horse. Choose a feed most suited to their bodyweight and workload and continue to make sure that the diet is balanced. If your horse has any age associated problems such as poor dentition or PPID then they will need some adjustments to their diet to offer them some additional support. For horses with PPID for example, they would benefit from a low sugar and starch feeding regime. 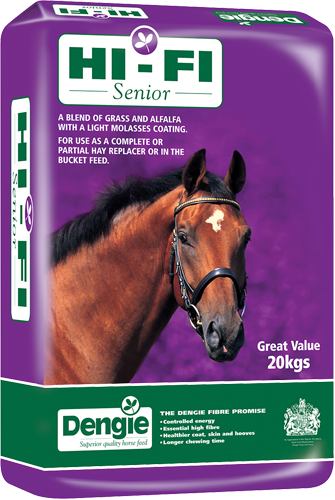 Senior feeds do however often have extra added ‘goodies’ to offer support for the senior horse and so are a great choice if they are appropriate for your individual. 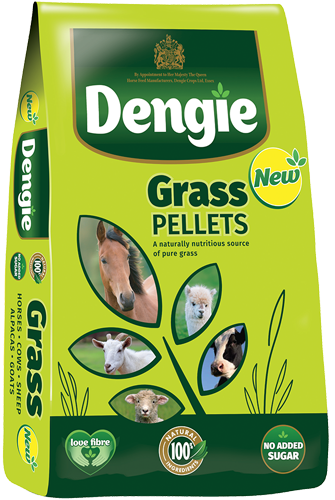 Dengie Performance+ Balancer, which is also suitable for the senior horse, not only supplies a broad-spectrum of vitamins and minerals for a balanced ration, but also has added glucosamine for joint support and prebiotic for digestive support both of which can be beneficial for the senior horse. My pony has PPID and is struggling to chew hay? 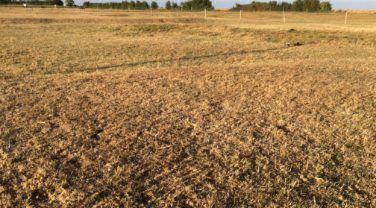 What should I use as a hay replacer? 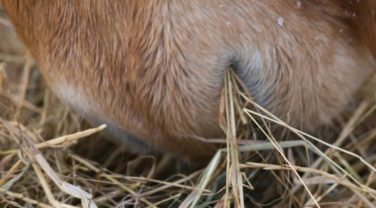 If your pony hasn’t had laminitis to date then it is likely that not being able to consume enough forage is the most pressing issue as weight loss will soon ensue if this isn’t addressed. It is also much harder to put weight back on an older animal compared with trying to maintain it. A grass and alfalfa based chopped fibre feed such as Hi-Fi Senior would be a good base to start with alongside some soaked Alfa-Beet which is very low in sugar and starch so will help to bring the overall sugar intake down. 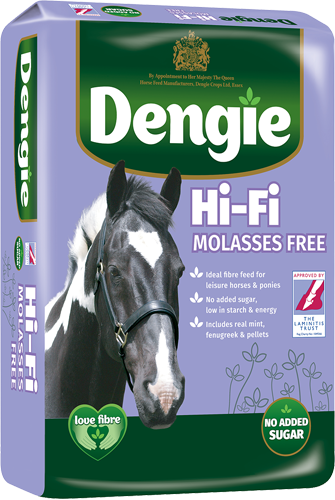 Although Hi-Fi Senior does contain grass, the overall sugar content is comparable with a grass hay so presents no greater risk than using hay. 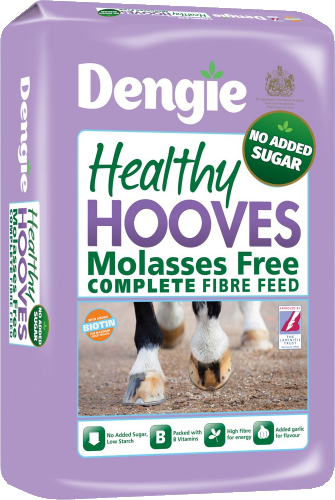 For horses and ponies with a history of laminitis, feeds such as Hi-Fi Molasses Free mixed with Alfalfa Pellets or high fibre cubes can be a lower sugar option than those based on grass. However, they won’t be as digestible and so a horse or pony may not do so well on them which may require some additional oil to be added to help maintain bodyweight safely. My horse has had laminitis in the past but now also has liver disease? What should I feed to help him hold his weight as he is starting to look poorer than I would like? When a horse or pony has multiple issues then we have to establish which is the greatest or most imminent threat to their health and welfare. Historically, the advice for horses with liver disease has been to avoid oil as an energy source and keep protein levels low. As your horse has had laminitis in the past, oil would be a safer energy source to use in preference to cereals which contain lots of starch. More recent advice such as that by Andy Durham writing in Equine Applied and Clinical Nutrition suggests that inclusion of oil at 0.1ml/kg bodyweight is perfectly acceptable for horses with liver disease and that levels up to 1ml/kg bodyweight might be required to safely maintain or promote weight gain. With regard to protein intake, it’s most definitely a case of low protein but not no protein as protein is needed as part of the immune system, hormones and building tissues such as muscle. Although the level of protein in pure alfalfa feeds often looks high and deters people from using it, it is important to consider that a large Stubbs scoop only holds 400grams of Alfa-A Oil so the actual amount of protein supplied is not excessive by any means. 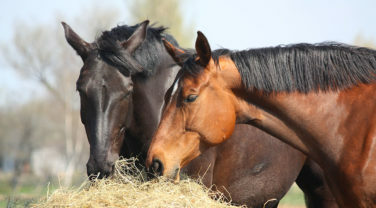 Given that alfalfa is so low in sugar and starch naturally, it is a really useful way to help horses maintain their weight, particularly those with a history of laminitis. 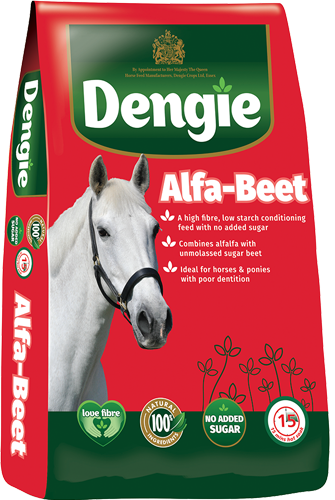 Therefore, feeds such as Alfa-A Oil are suitable when used in moderation for your horse. Pituitary Pars Intermedia Dysfunction (PPID) is a degenerative endocrine disorder that disrupts the control of hormones produced in the pituitary gland.